Draw for Fun is a free Windows 8 drawing app available under ‘Tools’ section of the app store. This drawing app for Windows 8 comes with a canvas where you can draw anything you like using various inbuilt drawing tools such as Line, Ellipse, Pencil, Rectangle, Eraser, Handwriting Recognition, etc. Also, there are features like writing in the given box at the top of the canvas and save it as text or save it as image. In addition, you can select border colors, fill colors, and select stroke thickness ranging from one to twenty. This feature is extremely beneficial if you want to make a Digital signature and note. Well.. this Windows 8 drawing app lets you explore your creativity using available tools. Let me quickly bring out the main features of this drawing Windows 8 app below. Lets you draw on the given canvas and explore your imagination. There are various inbuilt drawing tools such as Line, Ellipse, Pencil, Rectangle, Eraser, Handwriting Recognition, etc. Features like writing and saving it as text or image are easily available. 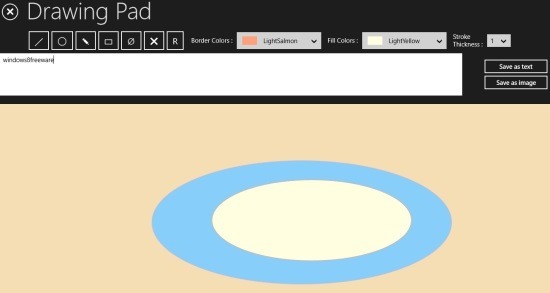 Lets you select border colors, fill colors, and select stroke thickness. Very simple interface and absolutely free to install. Well.. Draw for Fun is a good fun Windows 8 drawing app to play around with different drawing tools and features like writing by figure. It’s a good time pass app. Also, check out our posts on Painting Apps, and Image Resizing Apps. Head over to the app store and search for ‘Draw for Fun’ app (press ‘Win+Q’ to open the search charm). Now, you can proceed with further installation steps. In short, Draw for Fun is an entertaining drawing app to explore you creativity and draw anything on the canvas without messing up your surroundings. Go ahead and download Draw for Fun app in Windows 8 now.